Komondors were bred to be large, muscular guardians of sheep and later cattle, mostly without human supervision. Their most notable feature, their white, corded coat, was developed to act as a barrier against bear and wolf teeth and claws and to blend in with the sheep they guarded. Their fur also helps protect them against changes in the weather and Komondors are actually comfortable in both low and high temperatures. Komondors stand at about 25 and a half to 30 inches and their body is slightly longer than their height at the withers. Their eyes are almond shaped and must be brown to be considered for showing. They have wide nostrils and a wide, short muzzle. They are big-boned and rugged – true outdoorsmen. Despite their somewhat comical appearance, Komondors are strong protectors. They were bred to be flock guardians and contended with formidable adversaries such as bears and wolves. They are very confident dogs and need a strong leader in order to be a good family dog. Obedience training is a must and socializing them early on is imperative to avoid human or dog aggression when grown. Komondors are devoted to their families, wary of strangers and are highly intelligent. 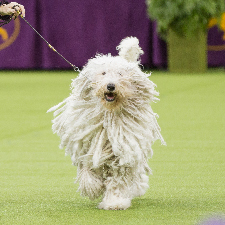 Owning a Komondor is owning an independent dog, capable of fierceness but also of love. Komondors live approximately 10 to 12 years. They mature a little more slowly than smaller dogs but their serious demeanor means less, if any, of the goofy adolescent years. Komondors are actually very lazy dogs due to their need to conserve energy when guarding a flock so they could fight any attackers on a drop. They were seen first in dog shows in the 1920s and accepted by the AKC in 1937. As of 2011, they rank 154th on the AKC Dog Registry.